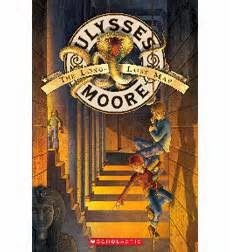 Way back in February I read The Door to Time (Book 1 of the Ulysses Moore series), by Pierdomenico Baccalario (Scholastic, 2006), and was disappointed to find that it was essentially a prequel to a series in which brave children have time travel adventures. There is no time travel until five pages before the book ends, when we get a teaser glimpse of ancient Egypt, where book 2 takes place. I have now read Book 2, The Long Last Map (Scholastic 2006) and found it entertaining, and most definitely Time Travel!